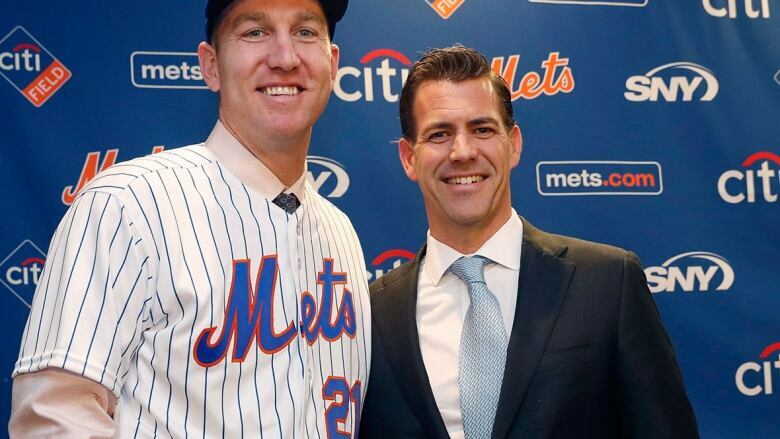 Baseball agent Brodie Van Wagenen has agreed to switch roles and become GM of the Mets, team spokesman Harold Kaufman confirmed Monday. Kaufman said chief operating officer Jeff Wilpon and Van Wagenen have settled on contract terms, although no paperwork had been signed just yet. Details of the deal were not disclosed. A news conference to introduce Van Wagenen is planned for Tuesday at Citi Field. He was chosen to replace Sandy Alderson, who took a leave in June following a recurrence of cancer. Alderson said the club's poor performance did not merit him returning. And so, at the start of a pivotal off-season, the Mets' first pitch is a changeup. The 44-year-old Van Wagenen is set to swap sides in labour relations. He has represented high-profile players all around the majors, including current Mets stars Jacob deGrom, Yoenis Cespedes and Todd Frazier. Van Wagenen also represents Mets minor leaguer Tim Tebow, the 2007 Heisman Trophy winner and former NFL quarterback. Van Wagenen played college baseball at Stanford with Houston Astros manager AJ Hinch, and the two became good friends. Van Wagenen has been co-head of CAA Baseball since 2010 and emerged as New York's top choice for GM from a list of 10-12 initial candidates. He must leave his clients and give up his career as an agent to take the job. Tampa Bay Rays senior vice-president of baseball operations Chaim Bloom was the other finalist. Kaufman said Bloom was informed the Mets decided to hire Van Wagenen. Doug Melvin also had a second interview last week, meeting with Wilpon and his father, Mets owner Fred Wilpon. But the former Texas and Milwaukee general manager was told days ago he was no longer in the running. Alderson was hired as general manager in 2010. He helped lead New York to consecutive playoff berths in 2015 and '16, including a trip to the 2015 World Series, but the Mets have struggled the past two seasons. NFL executive Mike Tannenbaum, vice-president of football operations for Miami, worked as an agent between jobs with the Jets and Dolphins. "In my role as an agent, my solution is to create opportunities for players to be successful both on and off the field," Van Wagenen said last week in a statement released by the Mets after his second interview. "My conversations with the Mets continue to be organic. I believe baseball is better when the Mets are competitive and successful." Following the team's second consecutive losing season, Jeff Wilpon was looking for a progressive thinker from outside the organization. He said he was open to "untraditional candidates," an approach that had support from his father, and wanted to have someone in place by the Nov. 5-8 general managers' meetings. Jeff Wilpon also said he would like Ricco, Ricciardi and Minaya to return — but that didn't guarantee they would be retained. "As Jeff and Fred continue their search for a new head of baseball operations, the players, fans and entire organization will be motivated to have a leader with the skills and commitment to win," Van Wagenen said in his statement. "If the Wilpons believe I am that person, we will have that conversation."